The Neurophile: Maybe maybe some day, maybe next week? Maybe maybe some day, maybe next week? One of the things I'm looking forward to most about my imminent graduation is guilt-free reading time. For some reason I can convince myself that it's okay to relax by watching movies, playing video games, or even spending countless hours browsing the web... but as soon as I pick up one of those all-text paper things, or even looking at something serious online, I get all guilty about the time I could be spending working on homework or reading for class. A Clock Shock: Mouse CLOCK Is Not Required for Circadian Oscillator Function by JP DeBruyne et al. This one is of particular interest to me because this article was just pointed out to me yesterday. Pten Regulates Neuronal Arborization and Social Interaction in Mice by CH Kwon et al, with preview by JM Greer and A Wynshaw-Boris. Again, of note due to a role in addiction. And finally, I'm only interested in Dopaminergic Control of Corticostriatal Long-Term Synaptic Depression in Medium Spiny Neurons Is Mediated by Cholinergic Interneurons by Z Wang et al (preview by CJ Wilson) because I sort of secretly hope that it will turn out to apply to corticoaccumbal LTD, although that seems unlikely. It's a loverly blog wot ya got here, mate! 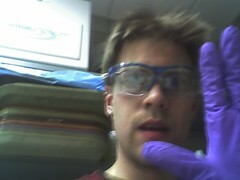 I actually work in Jay Hirsh's lab, feeding coke to mutant flies. Drugs and bugs, baybee! McClung was a Postdoc under Hirsh. Dan: Probably neurosci, electrophys-oriented to work towards drug addiction. But, dunno for sure. Taking some time off to decide. Much of the network's revenue Nike Free Run is estimated to wholesale nfl jerseys come from those subscriber fees, and that louboutin outlet revenue christian louboutin uk was down in the fiscal fourth quarter of 2016 despite higher contractual rates, according to the company's earnings call in November. Despite calls for Disney to sell the sports channel, CEO Robert Iger nfl jerseys store has expressed cheap nfl jerseys optimism about the property's future. "We have taken a more bullish position on the future of ESPN's sub base," Iger said on the November christian louboutin shoes conference call. "We think that while we were candid a year ago on sub losses, we believe that, to Nike Air Max 2015 Shoes some extent, the causes of those losses have abated, notably Nike Roshe Run the migration NFL Jerseys to smaller Nike Air Max 90 packages."